On arrival at Donkey Paradise I was greeted and made to feel welcome by all the two-legged and four-legged inhabitants. My accommodation was a comfy caravan – a superb “room with a view” looking across the valley to the mountains. Previous experience and knowledge of working with donkeys is not a prerequisite for coming here as a volunteer. There is always someone on hand to give help and advice and show you how to get started. You are greeted in the mornings by expectant faces in the stable and soon everybody starts singing the funny donkey “mealtime” song. If you take too long in serving up alfalfa they give you a little nudge to hurry you on. In the afternoon there are apples and carrots to be chopped. By early evening it’s time to round everybody up and bring them into the stables from the fields. Lola and Añes of course think this is a great game and will have you chasing after them through the orchards and down the valleys. Marleen has a wonderful network of supporters who come along during the week to help in various ways. I was shown how to groom the donkeys and even how to clean their ears! I was also fortunate to be there on a day when Miguel, the farrier, came to clean hooves, then clip, trim and file them. 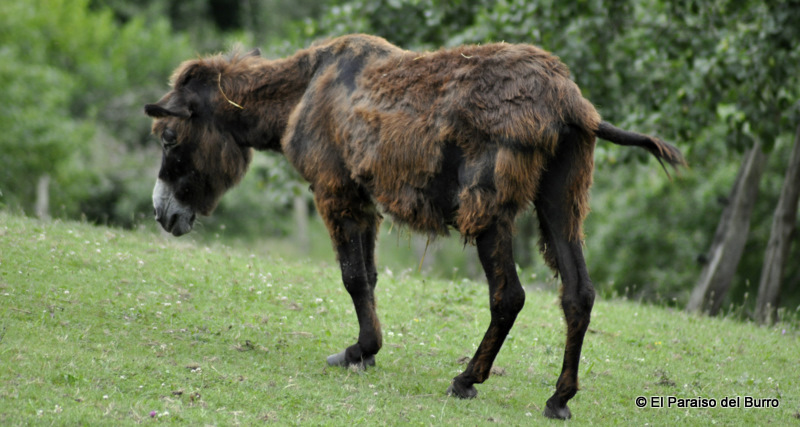 Care of hooves is a very important part of donkey well-being. In between working with the donkeys you are free to help with whatever other tasks you can. 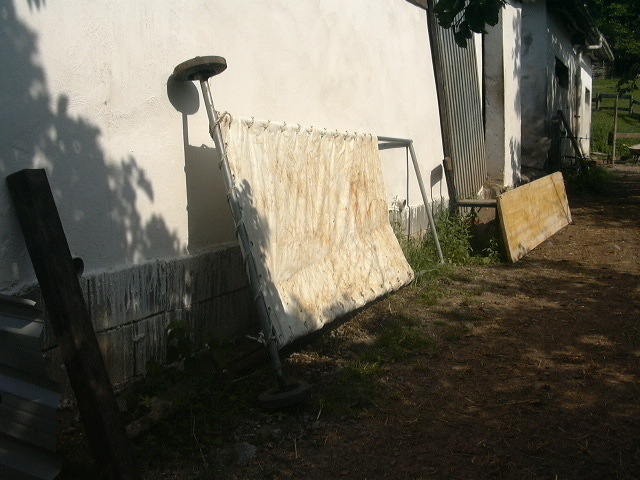 This includes tending the vegetable garden, fencing, giving a hand in the kitchen, etc. 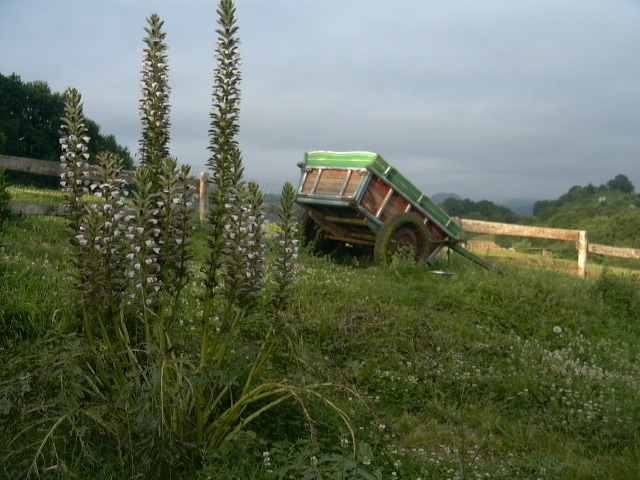 Every day is a new adventure on the farm and one afternoon a Spanish television crew arrived to do some filming. And so Marleen, the girls (Carla and Tanya) and the donkeys took on a new role as television stars! 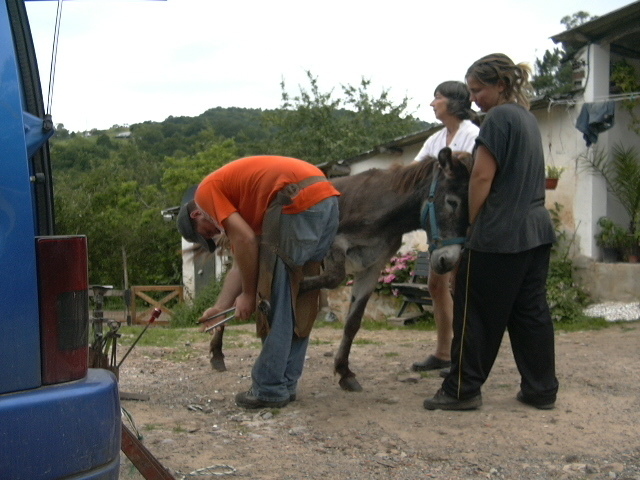 Hopefully the resulting documentary will help increase public awareness of what caring for donkeys entails. The Donkey Paradise supporters will go to any length in their efforts to care for the donkeys’ needs. Through ingenuity and hard work they were even able to build a “donkey ambulance” for cases where it’s necessary to move those who are ill or injured. For anyone who loves animals and outdoor living I can highly recommend spending time as a volunteer at Donkey Paradise. You will find it to be a very enjoyable and rewarding experience and whatever support you can give to the wonderful efforts being done there will be welcome. Good luck to all at El Paraiso del Burros! El Paraiso del Burro truly is a magical place where you learn and grow as people. For instance, we didn’t know very much about donkeys before we arrived. We quickly learned that all of the donkeys were individuals with their own personalities and habits. Like Norbert for instance, who we let into the garden to help us with our task of weeding. When our eyes were upon him he would pull up the grass with a speed we could not match. However, once our backs were turned he quickly began making himself a lovely salad of beet root, peas, and strawberries. Further mischief was seen every day in the adventure that was bringing in Lola’s gang (Lola, Anes, Ryo, and Kees) for their evening feeding. They were nice enough to give us several tours of the finca (in one day!) as they ran circles around it away from us. Our interactions with the donkeys did not just involve us chasing them though! We loved feeding time every night, when we were able to feed the donkeys and listen to the musical sound of 18 mouths chewing in unison. We were also able to practice some veterinary care by regularly cleaning out Joep’s hoof, giving injections to Platero, practicing physical exams, etc. Aside from working with the donkeys, we also really enjoyed the projects we undertook here such as building fences, gates, and weeding. The work was very gratifying and we only wish that we could have done more during our stay here. However, it was not all work here, on our off days we had the luck of visiting some of the beautiful sights that Asturias has to offer. This region is an amazing place. As a group we hiked the Cares walk which offered some of the most amazing views I have ever seen. We also took a trip to the coast to see the gorgeous Asturian coast line. Perhaps our favorite place that we visited was the surreal Black Forest, which was like nothing we had ever seen before. Furthermore, we also were able to meet some of the friendliest people this world has to offer. So, in the end, we leave with mixed emotions: sadness about leaving this one of a kind ‘”Paradise”, but also excited to share all of the stories and memories that we have of it. We have learned a lot, not only about donkeys, but about ourselves. We came to this place sure of many things. That we could never be vegetarians, for instance (and than we would go a week without having any meat and not even miss it). 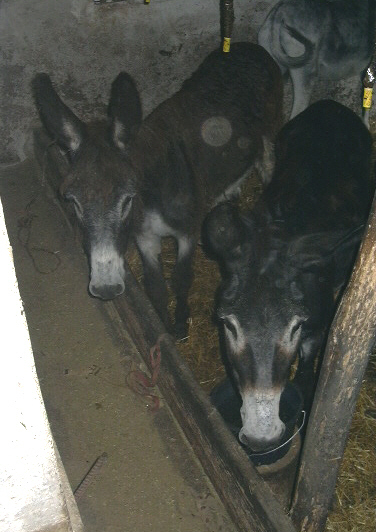 We were also sure that we were destined to be cat/dog veterinarians, but, after a few weeks of working with the donkeys (and the three wonderful horses), we are not even sure of that anymore (a state that is much more exciting!). One thing we can be sure of is that we have cherished our time here and cannot thank Marleen, Tanja, Carla, and all of 18 donkeys, 3 horses, and 5 dogs for all of their hospitality, patience, and generosity. We will never forget any of them or the great moments we shared here.